Fig 1: An induction coil at the Eskdalemuir Geophysical Observatory before installation. (Click to enlarge). Fig 2: The induction coil is placed on a levelled bed of gravel and linked to a break-out box and digitiser. (Click to enlarge). Fig 3: Induction coil is installed beneath the wooden covering to deflect rain, wind and snow. Data is passed through a digitiser and delivered via the internet to the BGS office in Edinburgh on an hourly basis. (Click to enlarge). An induction coil (or high frequency magnetometer) consists of two coils of insulated copper wire wound around an iron core. Induction coils permit us to measure the very rapid changes of the magnetic field at frequencies between 0.1 and 1000 times per second. This part of the electromagnetic spectrum is called the Extremely Low Frequency (ELF) range. 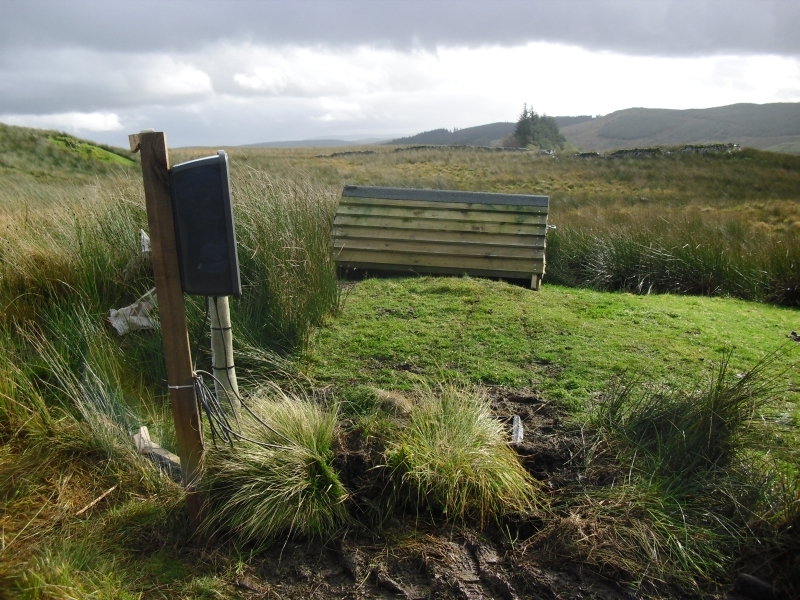 In June 2012, the BGS Geomagnetism team installed two high frequency (100 Hz) induction coil magnetometers at Eskdalemuir Geophysical Observatory in the Scottish Borders. 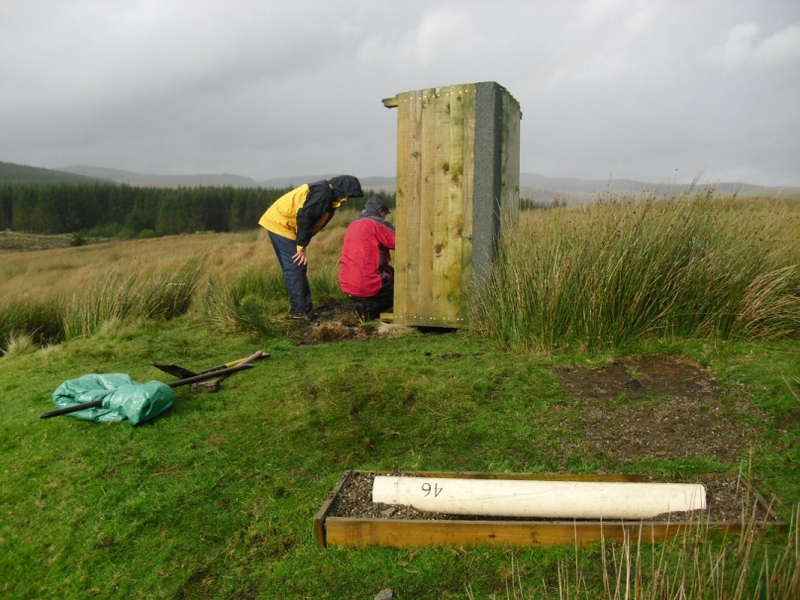 The coils were installed on the Eskdalemuir observatory site, an electromagnetically quiet region of the UK. 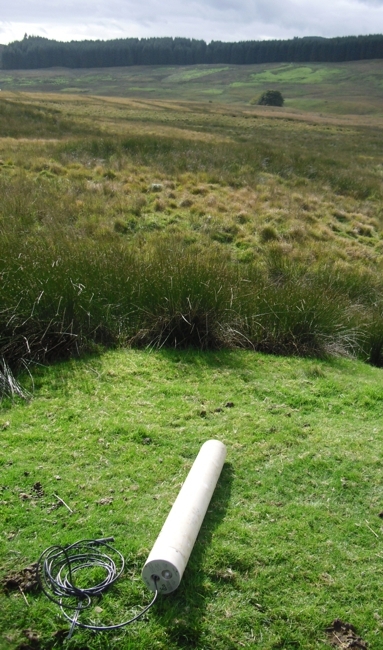 The coils (white tube, Figure 1) were placed under a protective wooden covering in an empty field (Figure 2) and are linked to the internet via a computer system in the seismic vault about 100 metres away. A small breakout box and digitiser lie close to the coils (Figure 3). The data from the induction coils are returned on an hourly basis to BGS Edinburgh. 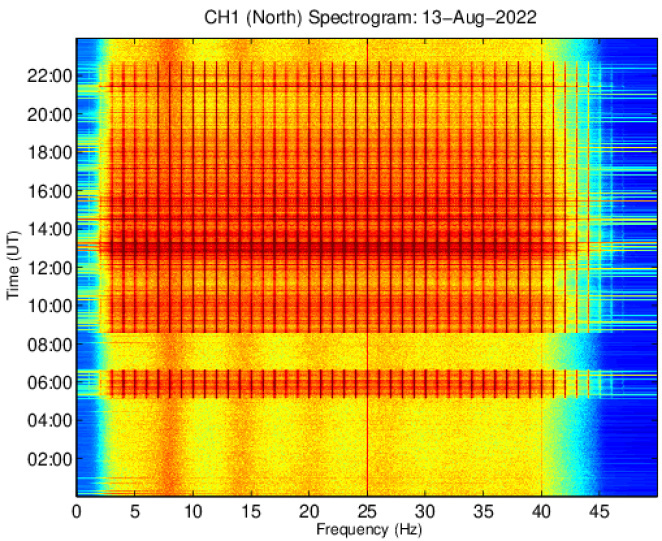 Figure 4 shows an example spectrogram (i.e., power at each frequency versus time) from the North pointing (Channel 1) coil for 23rd July 2012, filtered over the frequency band of 3-50 Hz. The diffuse bands of peak power at all times (i.e. 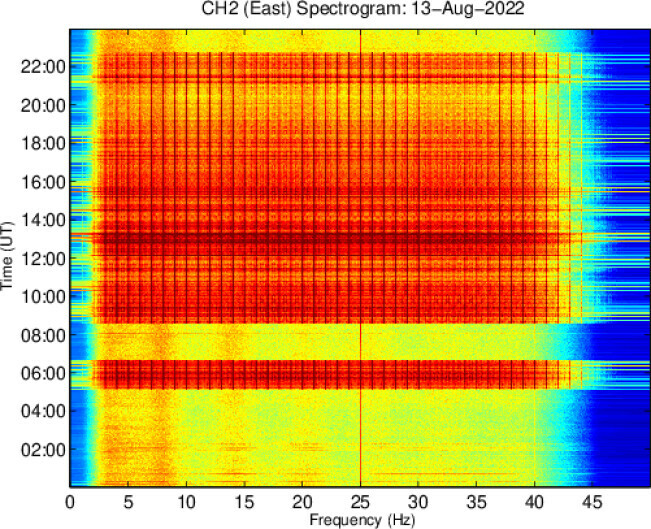 vertical diffuse red regions denoted by arrows) are the global Schumann resonances, while the strong broadband (horizontal) spikes are due to local lightning activity or short system errors. Note also the strong thin peak at 25 Hz is a harmonic of the UK electrical power system (which ‘hums’ continuously at 50Hz). The Schumann resonances are a natural set of spectral peaks in the ELF portion of the Earth's electromagnetic field spectrum, caused by lightning discharges from within the cavity formed by the Earth's surface and the ionosphere . Schumann resonances occur because the space between the surface of the Earth and the conductive ionosphere acts as an (almost) closed waveguide, and should appear as distinct peaks around 7.86 Hz (the fundamental frequency), 14.3 Hz, 20.8 Hz and so on. However, in reality the peaks tend to be diffuse due to the effects of a leaky cavity, ground absorption and the geometry of global lightning storms . Here is an animation of Schumann resonances in Earth's atmosphere from NASA/Goddard Space Flight Center/Conceptual Image Lab. 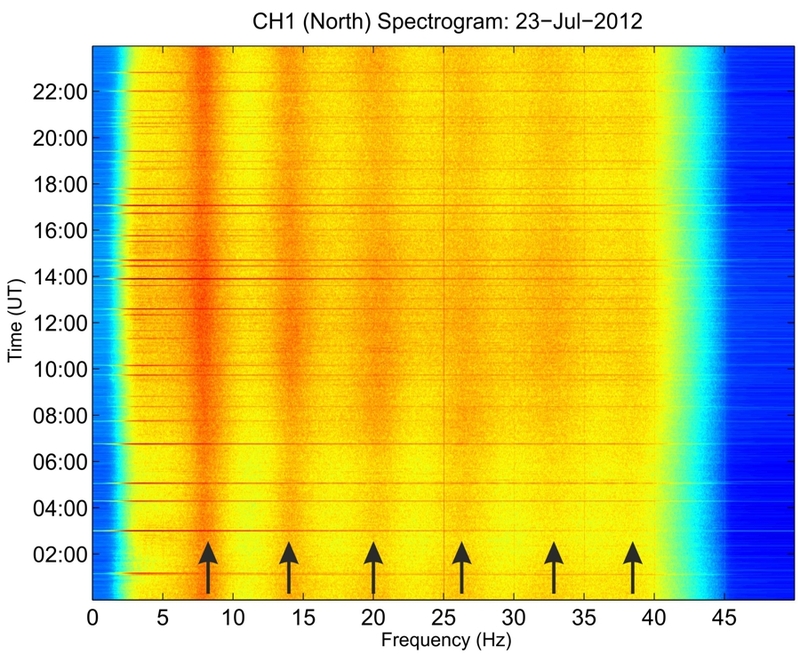 Fig 4: Spectrogram of the 100Hz data from the Channel 1 (North pointing) induction coil magnetometer for the 23rd July 2012. Arrows indicate the diffuse Schumann resonances. Note strong signal at 25Hz which is a harmonic of the UK power grid. (Click to enlarge). This is a new research project, which we hope over time will lead to a new data set for monitoring global lightning storms and related ionospheric phenomena . For example, note the diminished intensity in Figure 4 during the local UK night time until about 08.00. This is due to the lack of thunderstorm activity over Africa and North/South America at this time. Later in the day, the heat from the sun shining over the equatorial land regions begins to trigger thunderstorm formation. Consequently there is an increase in lightning activity and the Schumann resonances become stronger. Spectrograms of yesterday's data are available below. Please note this is an experimental setup at the moment, so there may still be issues with missing data or lost data points in the plots. Yesterday's spectrogram of the 100Hz data from the Channel 1 (North pointing) induction coil magnetometer. (Click to enlarge). Yesterday's spectrogram of the 100Hz data from the Channel 2 (East pointing) induction coil magnetometer. (Click to enlarge). The induction coil data are available upon request. We wish to thank Thibaud Gabillard of ESEO, France for developing and coding the spectrogram generating software.